There is now a very real mental health risk associated with our fear of missing out. The rise of social media, booming technology and our constant ‘connectedness’, is contributing to rises in anxiety, depression, self-doubt, compromised confidence and changes in our social behaviours and communication. I switched off & learnt to shut down the FOMO! I am not immune to this new phenomenon, using daily social media to stay connected with friends, family and business. It’s actually BECAUSE of SOCIAL MEDIA, I can have friends all over the country & my business can flourish. Social Media is not evil or the enemy, it just needs to NOT be used at the expense of true “real life” connections. Have you ever looked at your screentime on your device? You might want to take a little look! You might be surprised at how much of your day, week, month is actually used on your device!! I WAS!!!! And some (well lets face it!) a lot of time, was at the expense of time with my family & my mental health! ✘wasting countless hours scrolling through a news feed I really couldn’t tell you what was on it!! BECAUSE MY FEAR I MIGHT MISS OUT ON SOMETHING WAS RULING MY LIFE! I was to go from 8pm Friday Night till 7.30pm Sunday night, with no social media! Why the odd hours? Why not a full 48 hours? I had a facebook live training scheduled for 7.30pm on the Sunday Night and I didn’t want to miss out!!!!!!!!! Can you see it? Yes, I set a challenge to prove that FOMO didn’t rule my life and without realising (until now) the parameter was set around my fear of missing out!!! Now this challenge was not easy, don’t get me wrong! I found my finger hovering over the facebook button a number of times. Once or twice, I even hit the button, however I closed it before it had a chance to load. Another, time I was chatting to hubby, when I looked down and facebook had loaded. I had no recollection of tapping the App. However, there it was sitting open and I HAD NO IDEA HOW. Again I closed it without looking at anything. Or the time I sat thinking “if I jump on hubby’s phone and facebook no-one will know I broke my challenge” (It was only a thought – I didn’t look!). What have I achieved? A realisation about how much I rely on that little app, to fill time, distract my mind and feel connected to my world! How I had lost the ability to connect with myself and my world around me, to be ok with being with me! And GUESS WHAT? It’s 12pm on Monday Morning and I am yet to actually open facebook – YES I missed my live training – I’ll watch the replay! I’ve survived 64+ hours without social media and I haven’t missed out, the world has not ended, the walls didn’t fall in!!!!!!! Saturday morning was spent bush walking with my husband. Watching him take photos of the waterfall & nature, enjoying his company, conversation & photography passion. There was something about being still and taking time out, that allowed me space to learn to be okay with being quite & with myself! What’s this challenge changed? I have made a promise to myself, to alter the way I use social media. To remember to switch off regularly and be gentle with myself! Because I am human, a work in progress. Sometimes I’ll get it wrong, THAT’s OK!!! I may just need to remind myself, of all the benefits I tell others about self care & mindfulness. WHAT WILL YOU DO TODAY TO SWITCH OFF & GET CONNECTED WITH THE WORLD AROUND YOU? Sweet Potato Toast is delicious, nutritious and so easy to make! This is the perfect healthy breakfast alternative or make-ahead take-along lunch. You need to remove gluten or wheat from your diet or just feel blah & bloated after your morning piece of toast? Not sure what you could replace bread with or feel you don’t have time in the morning to think about options? Are looking for a healthy alternative to the standard cereal or toast and peanut butter or Vegemite. Your just looking for a healthy nutritious, delicious brekkie or lunch! 🍠 put in the toaster, as you would bread and toast (yep that easy!) – it may need to be pushed back down 2-3 times depending on thickness. 🍠 make toppings ahead the night before and have ready to go in the morning (leafy greens & tomato salads, dips like guacamole, tzatziki or hummus are good, or avo smashed with any of these boiled egg/feta/ricotta/tahini and drizzled with lemon juice all work well). 🍠 hemp seeds, sesame seeds, flaxseeds, pumpkin and/or sunflower seeds all make great additions. As do nuts like almond, pistachio, cashew, walnuts and pine nuts! 🍠 if your heading out early or lack time in the morning, make a take along brekkie before you go to bed – it’s a much healthier option for your mind & body then relying on coffee alone! 🍠 Switch out the sweet potato for thick pumpkin slices (they’ll need roasting not in the toaster) for a delicious alternative! 🍠 Works well cold as a lunch for school or work too! We love Chocolate Avocado Mousse in our house – have you tried it? Do you love to indulge but want to skip the guilt? Feel like something naughty, that’s actually really nice and not so naughty after all? Want chocolate Mousse that’s healthy enough you could eat for breakfast? Try our chocolate avocado mousse, full of good fats to keep you feeling full longer, concentrating & focused and help to balance and restore hormonal health! Oh and GUESS WHAT? You get the option of making the mousse two ways! Yep not one but two recipes for chocolate mousse, their both so delicious and nutritious, we couldn’t decide which one to include so we added both! It’s about Simple Nutrition, Nourishment & Enjoyment! If your struggling with what to eat, how to feed your family due to specific dietary requirement or you just simply need help planning health meals. 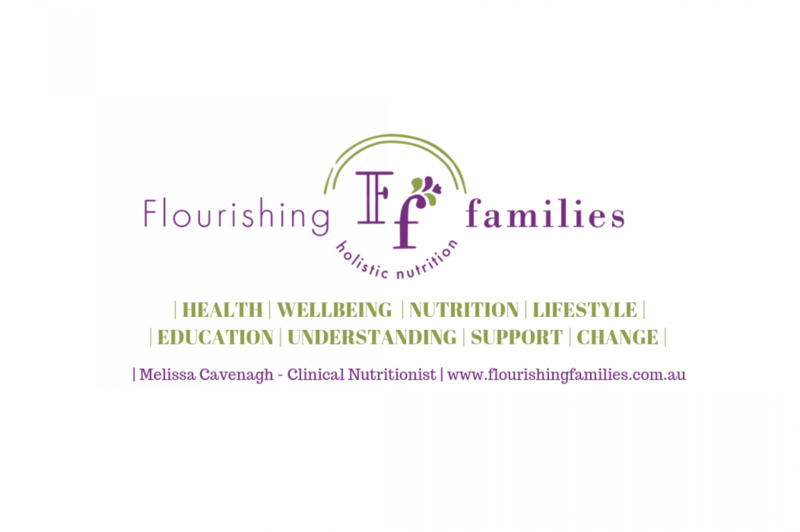 Flourishing Meal Plans is for you! Specialised meal plans designed for your family’s individual needs containing Menu(s), Recipes, Shopping list and all the tips & hints you need in the kitchen, for health, nutritious meals to meet your individual needs. Get in touch if you’d like more information on our meal planning services. Or why not check out our Bio-Compatibility Testing? Find the foods that best support your body in reducing inflammation and promoting healing and optimal health.